I love a fresh start- and though i know that it is true that every day IS a new day, there is something about the endless possibilities of a whole new year that inspires us to think about what we would like to create in our lives this year. (A fabulous link with lots of suggestions for goals in the new year is Daring to Live Fully). 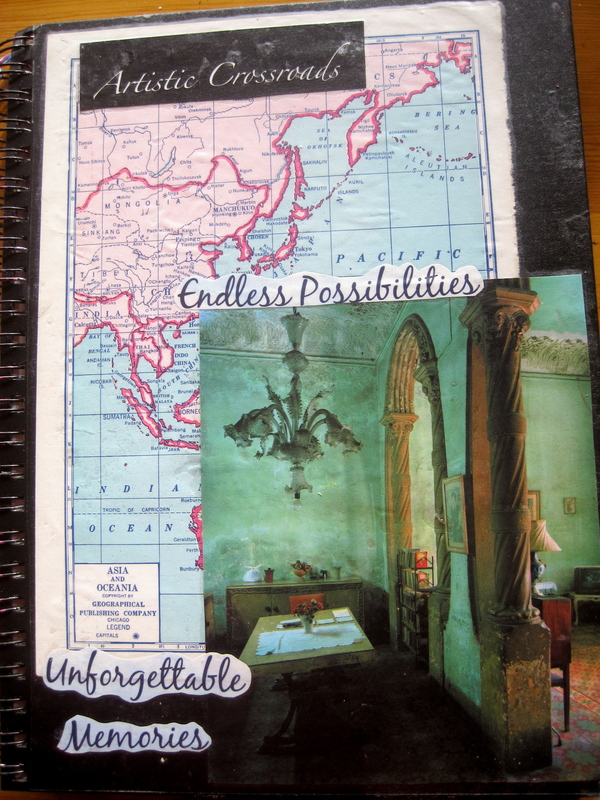 I like to start in on a new journal for the new year-i take a regular sketchbook & put images & words that appeal to me on the front & back & then cover them with contact paper- you can see that this one has the words “endless possibilities” on it. I use it to journal about everything. 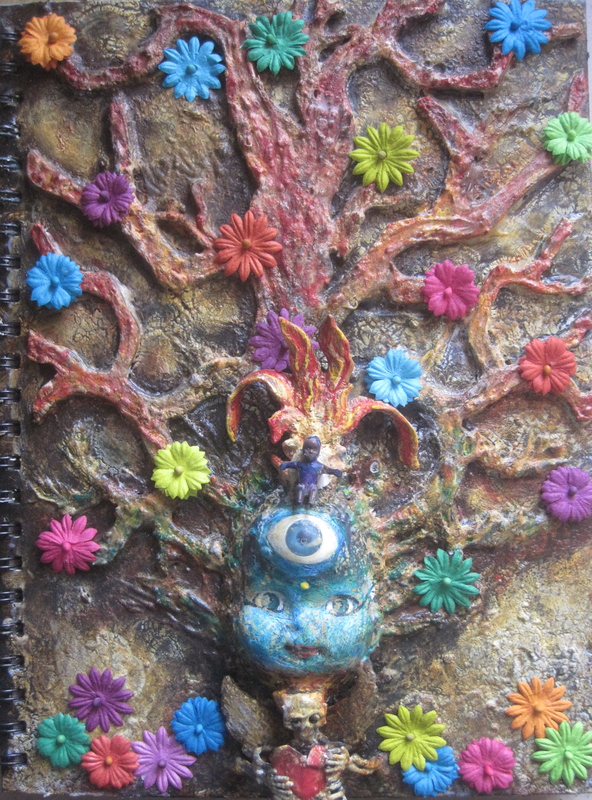 When i want to get specific, I also have a journal for my gardening ideas- this one I made in a Michael deMeng workshop-“Tree of Life”: Here’s one for things I want to do in my house. I create pockets by using packing tape and heavy paper so i can put ideas i have printed off my computer in the pockets. I love so many of the amazing visual journals that i see out there – here are just a few: Lisa Sonora Beam; Teesha Moore; Dan Eldon; etc. I usually just write in mine, scotch tape articles or pictures that inspire me on to pages and add a few sketches of ideas. Here’s a tip that has worked for me when i see all those amazing journal techniques out there and don’t start a journal because I want to do a really “cool” journal too but don’t think i have the time or skills: first, i try not to compare myself to others but just start simply- scotch tape & a stapler work great- i can always embellish, paint, collage, and stamp in these journals if i decide i want to as i go along. 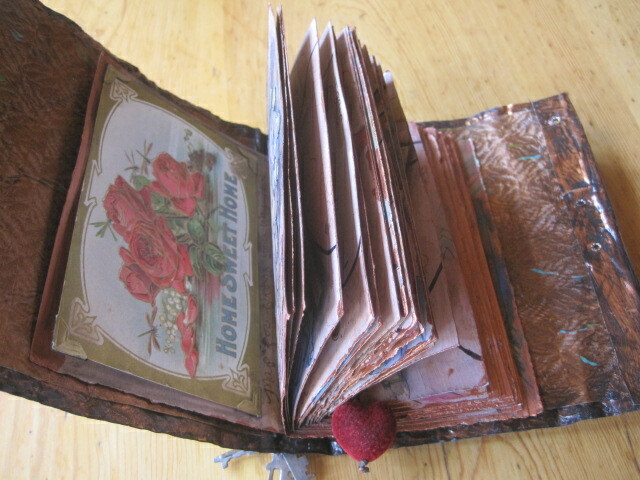 I put a little more effort into the covers- glueing on photos or found objects like i did in the garden one. I find once I have a start that i am more apt to experiment with the pages. Speaking of getting started on creative projects- in last weeks blog I talked about how we can become paralyzed by so many creative possibilities and I offered up a tip by Kelly Rae Roberts that can lead to getting in the studio & doing it. This week my “Jedi Mind Trick” is: Assignments. When Jill Berry asked me to contribute some art maps to her book: “Personal Geographies: Explorations in Mixed Media Mapmaking” it was pretty easy to come up with ideas for each project because a specific map subject was the assignment. Within a framework there are many fun possibilities to explore. 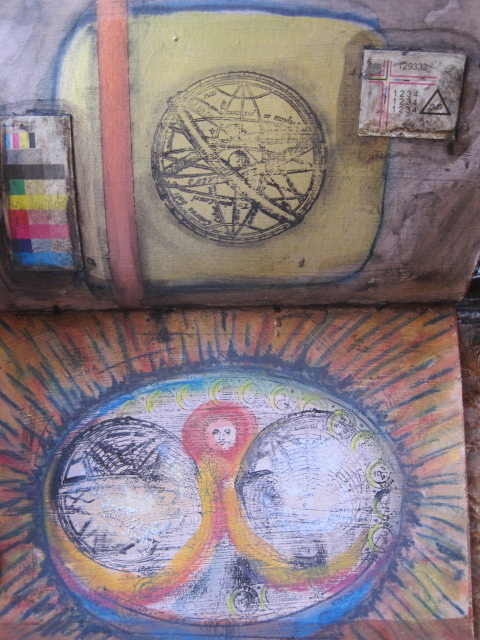 Some of the subjects in the book are: a head map, a narrative map, a cartographic reliquary, a channeled map and a hand map. For the Hand Map I wanted to use metal embellishing, some traditional cartography elements (cartouche, border, neat lines) & the idea of being present in the now, so I came up with: “Be Where Your Hands Are”: I am in an Art Club where we draw a word once a month & make a piece inspired by the word to share at the next meeting-having a specific subject allows for creativity without overwhelm! This month’s word is “Prescription” -I would love it if you do the assignment too and send me a photo of your piece to share with the group!! Some ideas for coming up with assignments are: buy a book like Jill’s and do the “assignments”,or check out Illustration Friday which assigns topics every week or create assignments for yourself. For example, I have always been intrigued by the Muses and also love to explore new techniques- so, i have created an assignment for myself. 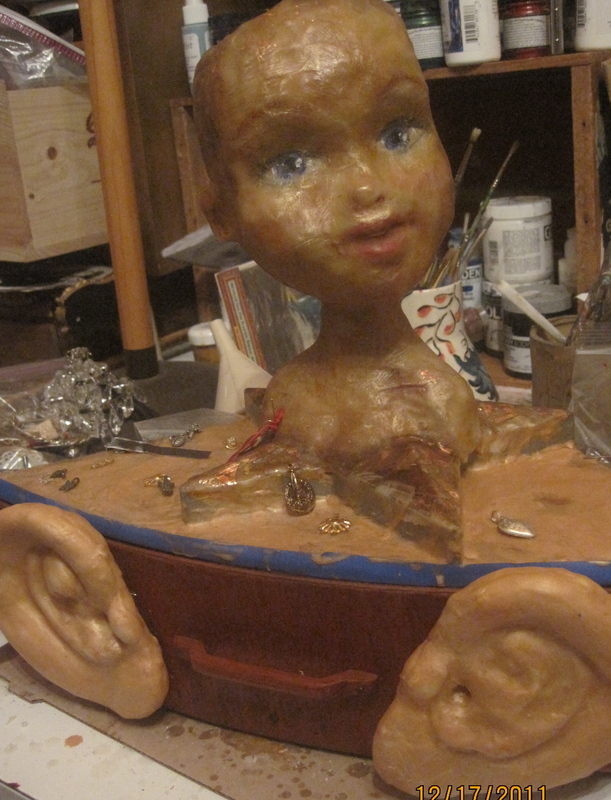 I am going to create a head reliquary for each muse (a reliquary is a container for a material sacred object- the relic) using a different medium on each one. 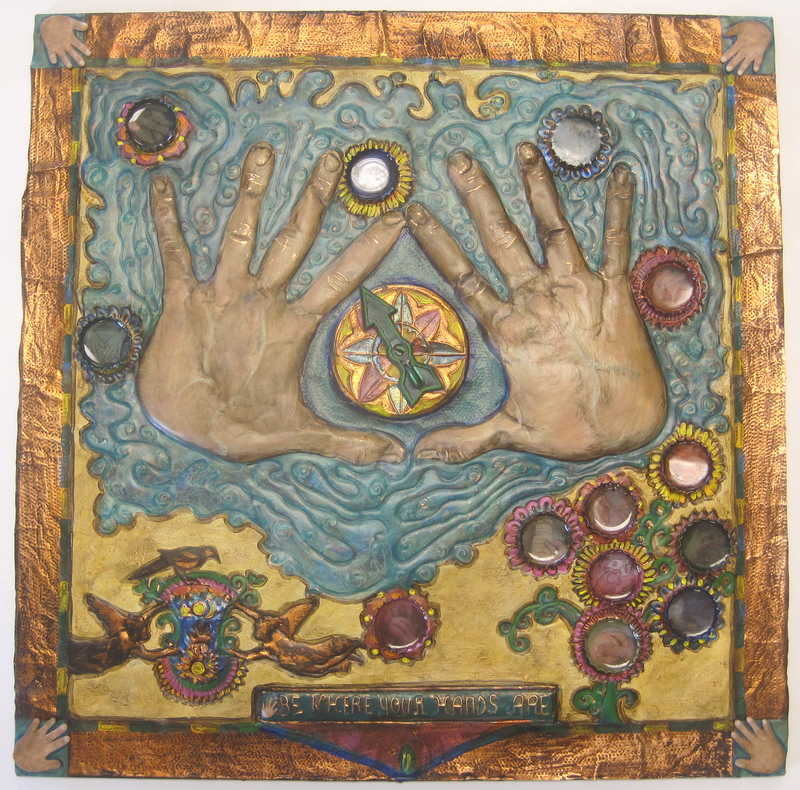 I put the name of the 9 Muses plus their parents (Mnemosyne & Zeus) into a box and in another box i put techniques that I want to explore (plaster, encaustic, metal etc.). I randomly draw a name & then the technique I will use on it. Mnemosyne is the personification of memory and the first name that i drew. Synchronistically i drew “memory jug” as my technique. 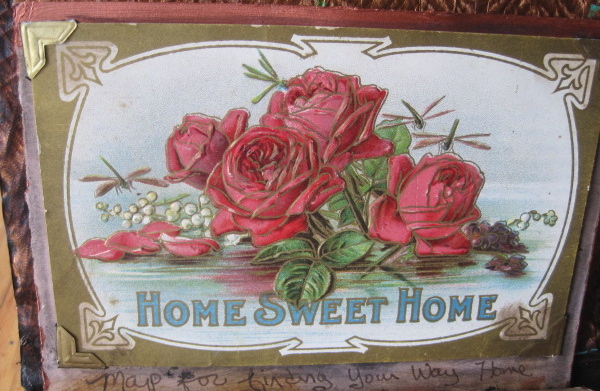 I had a shoe box filled with little collectibles that belonged to a friend’s mother who had died- what better representation of memory could there be? 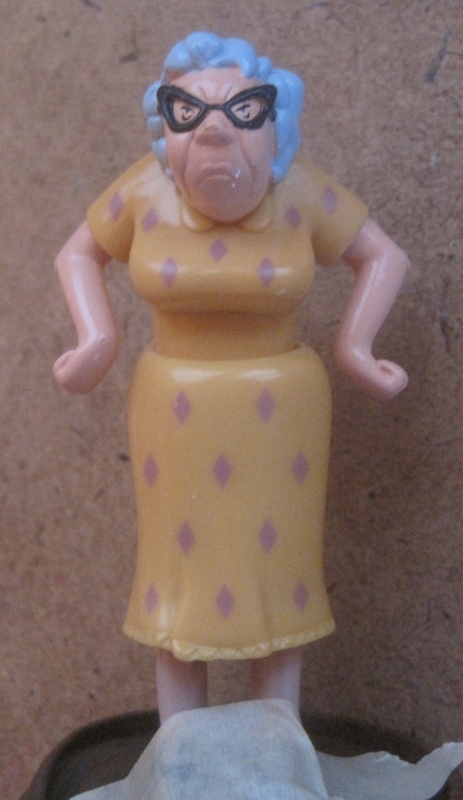 I used memory jug techniques like window caulking to stick the collectibles on Mnemosyne’s head in a pattern of similar colors. 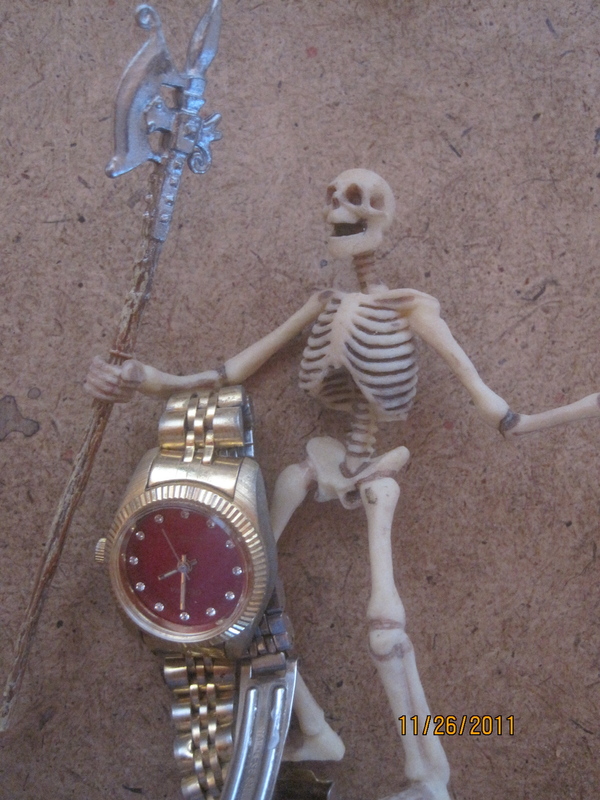 The relic- a watch which represents the memories created through the passage of our time here on earth- is seen through the window in her neck. What will your assignment be? Its a new year- filled to the brim with endless possibilities. I love the idea of endless possibilities- so much so that a dear friend made this for me to hang in my studio- but since i retired on June 1st i have been completely stalled out over “endless possibilities!”. Sunday on NPR I heard bits & pieces from a TED talk on choices by Barry Schwartz – oh yeah did i ever relate! !- endless possibilities can create paralysis (have you tried picking out a glue recently for your art project?-what’s the best glue for paper? collage? metal? glass? canvas? or mixed media? Is it an acrylic medium? rubber cement? epoxy glue? hot glue? contact cement? silicone glue? Ailene’s Tacky Glue? Yes Paste? Modge Podge? E 4000? glue pad?, glue stick?-well, you get the idea!) Endless possibilities can also create less satisfaction-always questioning- did i really make the right choice? (all that time & effort to choose but was it the right choice?!) and an escalation of expectations- there are so many choices that I expect the one that i finally pick to be perfect but what if its not? I have experienced all of the above since i retired. I thought i would be jumping right in to making & teaching art-after all that is why i took that leap of faith- but with endless possibilities what did i want to do? paint? & if painting it was, then what kind? mixed media? process? visionary? 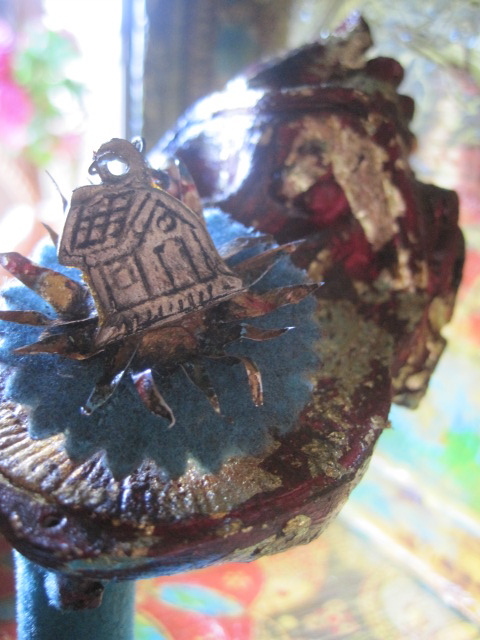 What about assemblages- my found object sculptural pieces- what should the theme be? should they be inspired by reliquaries? Did i want to make things that would have more universal/commercial appeal or Did i want to make art for just the process of making art? Are they mutually inclusive or exclusive? And the workshops- oh my- what to teach? where to teach? when to teach? how to get participants etc. And then there is my unique artist’s voice: after looking at other art work that I love- everyone from Van Gogh-(where i was lucky enough to visit the show at the Denver Art Museum: “Becoming Van Gogh”) to the outsider artists in “Raw Vision Magazine” to the folk art that i collect on my travels: i felt like i wanted to emulate the styles of each and everyone- what and where was MY voice? Okay, so, you can see how i got stalled out! What about you- have you ever gotten over whelmed with all of the choices we have today? How did you handle it? I decided to take a step back and give myself a break -I re-organized the studio- thank you Joe and Ikea! then the garage, my file cabinets, and eventually my whole house. My home really feels good now though i am having trouble finding things. LOL!! . 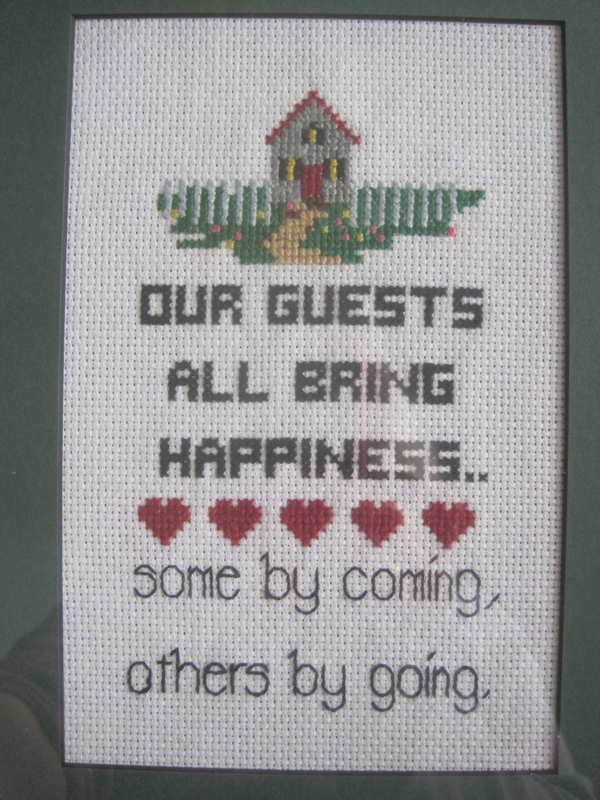 for my family to write what they are grateful for on the leaves, a wreath for my front door etc. A week ago my Muse returned -(7 months since retirement!! )- I went in the studio & started painting: here is the painting-a work in progress: I also came up with a fabulous way to create a Santos/Cage doll:from a Barbie for a future workshop and an interesting trick that will help me pick a theme for my next series of assemblages(more on this trick next time) How did the turn around happen? with the help of these wisdom nuggets: a quote by Amelia Earhart struck me like lightening -its so obvious i know, but sometimes you have to be in the right frame of mind to really “get” it! 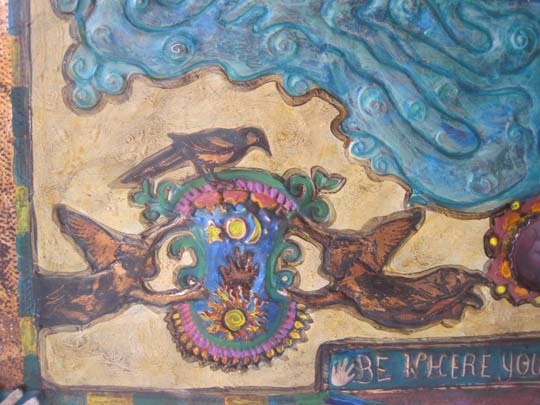 :”The most effective way to do it, is to do it.” AND Kelly Rae Robert’s tip in the Nov., Dec., Jan., issue of “Where Women Create”: “When creating art, I almost always convince myself that i’m just experimenting. This is my little Jedi mind trick i do to help me stay unattached to the painting. The more unattached i can be, the more fearless i am with the canvas. The more fearless, the more fun.” Inspired, i went into the studio to just do it while convincing myself i was only experimenting- sure enough, i started having fun and the creative juices broke loose!! YAY!! Happy, wonderful ,creative new year everyone!!! 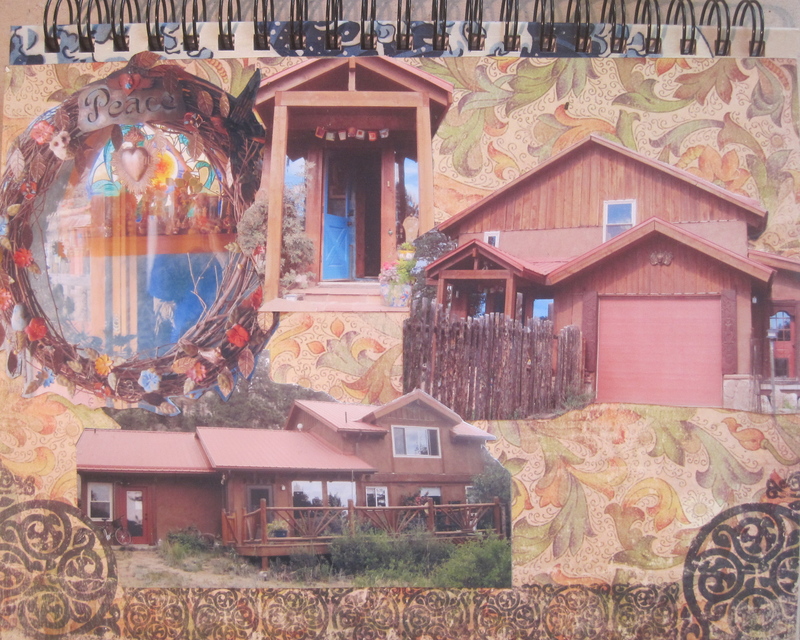 As you can see from my previous blog: “Feeling the Fear & Doing It Anyway” my reliquary evolved into blossoming. 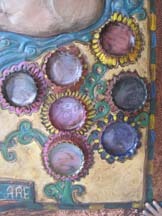 The Inner Critic “lid” comes off to reveal the relic: a blossom. And so even though I am feeling some fear I am looking forward to blossoming in this next stage of my life!!!! Whoohoo- bring it on!!!!! My number one New Year’s resolution for the last few years is to work on being present, being in the NOW- not ruminating over the past or projecting into the future. Here. Now. what better way to do that than to be where my hands are? So… when Jill Berry proposed Project #1 “A Map of Your Hand(s)” for her book: “Personal Geographies: Explorations in Mixed-Media Mapmaking”, I decided to make a map about being where your hands are. This one is not in the book but is on display at the downtown Denver Public Library show,”Personal Geographies”, through March. 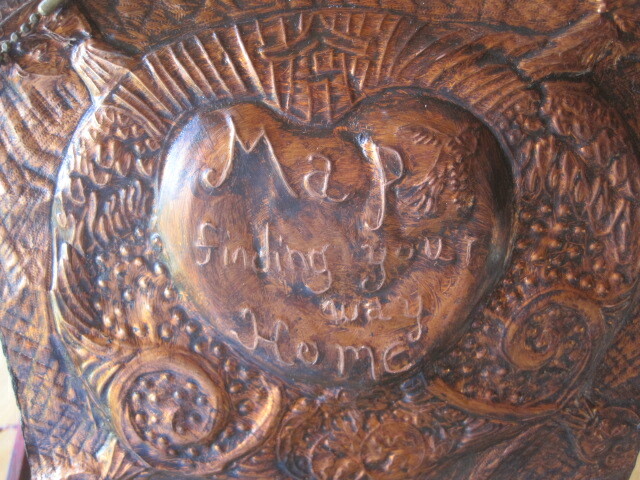 I used a copper sheet for the base since engraved copper maps began appearing in the 16th century. I traced my hands and used metal embossing techniques to create the texture and relief. (as in “topo” relief maps) I used photos that I had of my hands from the time I was a baby until now & enclosed them in the bottle caps. 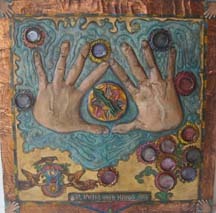 I wanted to create a map of my life from birth to now and to show that wherever I was during my life so far, that is where my hands were too – thus the saying “Be Where Your Hands Are”. The spinner is symbolic of a compass rose & wherever it spins & stops that is where we are: where our hands are! Jill Berry asked me to be part of her book: “Personal Geographies: Explorations in Mixed Media Map Making” and participate in the various map making projects featured in the book. The book just came out & I am thrilled to have quite a few projects in it!!! 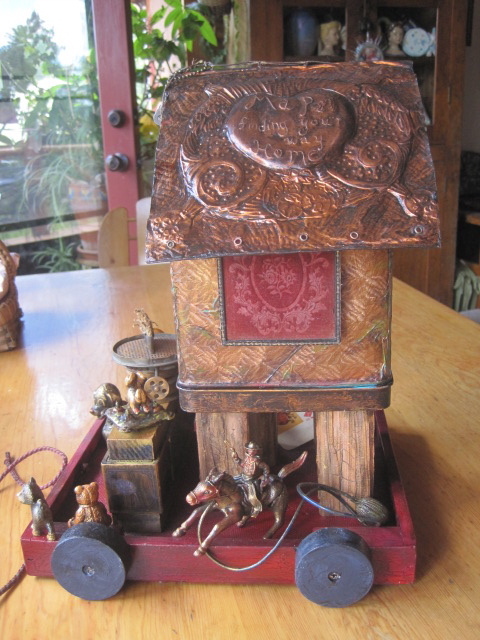 I made the assemblage, “Home Sweet Home” for Project # 7 “The Cartographic Reliquary”. It is not in the book but it is in the Personal Geographies Show on the 5th floor of the downtown Denver Public Library through March 31st. I hope that you are not lost & have found or are in the process of finding your way back to your Home Sweet Home!! What does the Voice of Inner Wisdom look like? 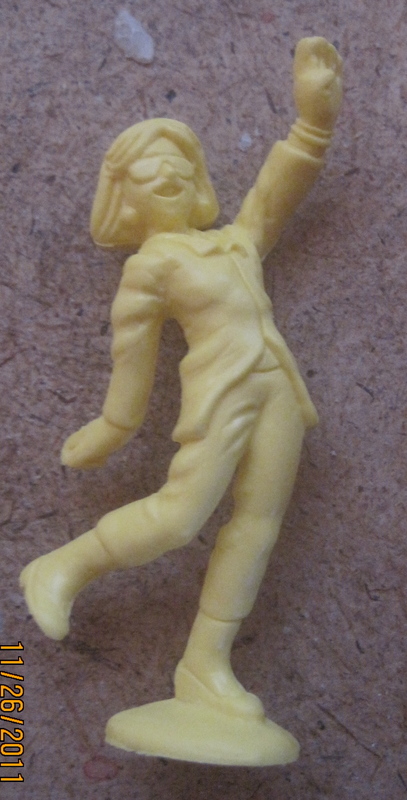 Ahhh that is what makes creating art so interesting to me- how to take an ephemeral quality & give it a visual “body”. As you know, i am super interested in reliquaries right now. Simplistically, reliquaries are the housing for a relic and a relic is a material object that becomes imbued with sacred power because the observer believes it is so. The Voice of Inner Wisdom is sacred to me. When i pay attention, I find that she directs me in miraculous and surprising ways. So, i decided to start making “The Voice of Inner Wisdom Reliquary”. 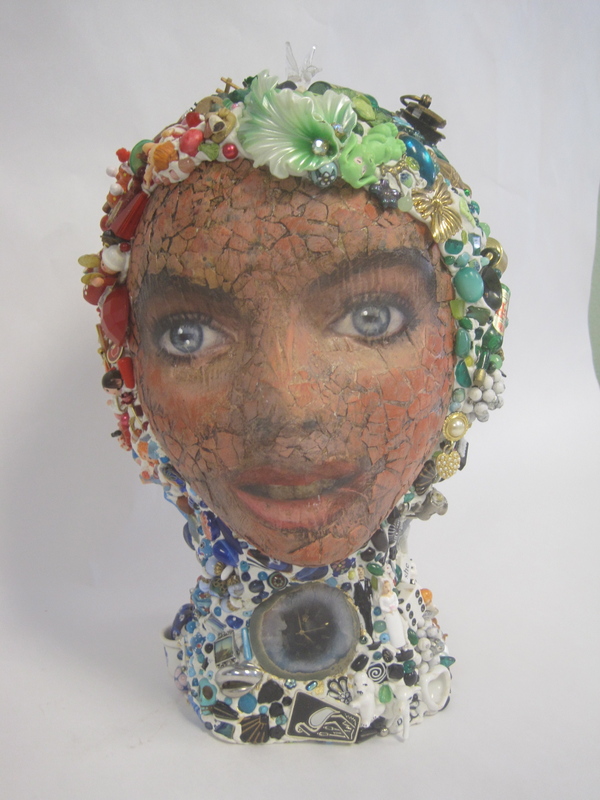 Once again, i turned to my stash of recycled” trash into treasure” big Barbie doll heads- it is ironic to think of making a reliquary out of such a controversial doll head but that is one of the benefits of creating with intention- intent imbues inanimate objects with meaning and as the “creator” i can change the original intention into one of my own making. 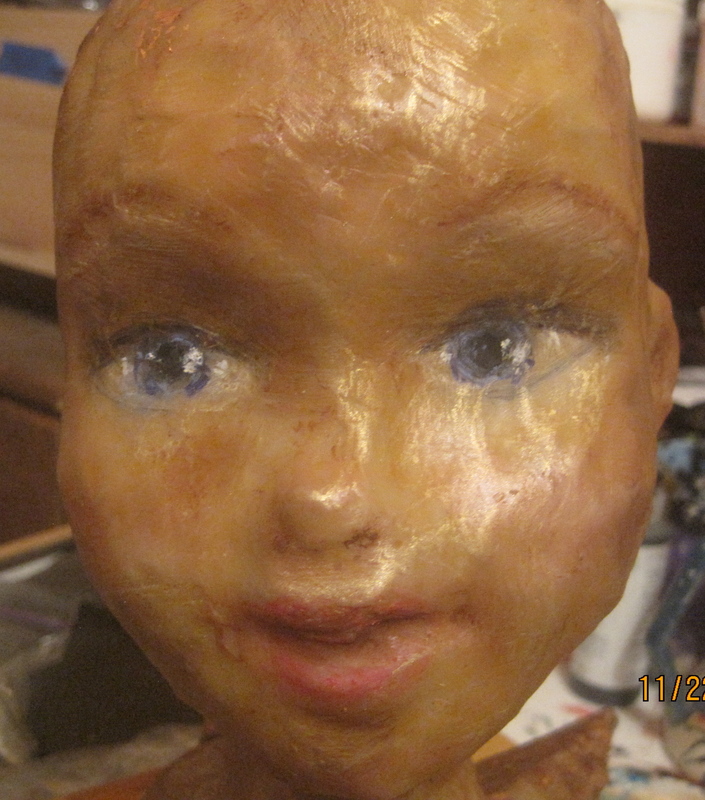 To start I covered the head in paper & then beeswax & “painted” her features in with oil pastels. The voice itself is slowly developing with flaming lips & pearls of wisdom coming out of them- photos will be in the next blog. 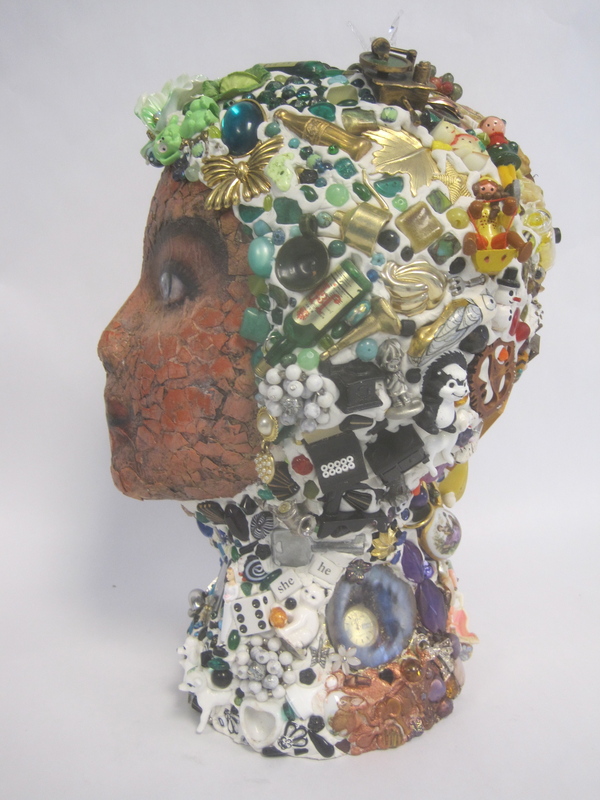 The head is the reliquary & the voice will be the relic- currently the whole assemblage is a work in progress. 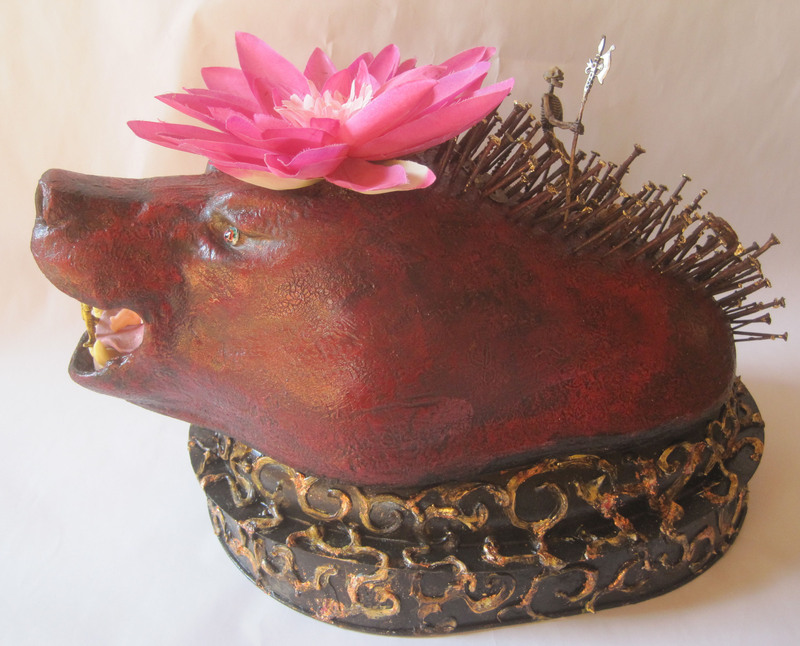 The head sits on a corner drawer- with “giant” ears for listening to that Voice of Inner Wisdom & the pull out drawer will be available for journals to record events when she spoke & the results, affirmations etc. 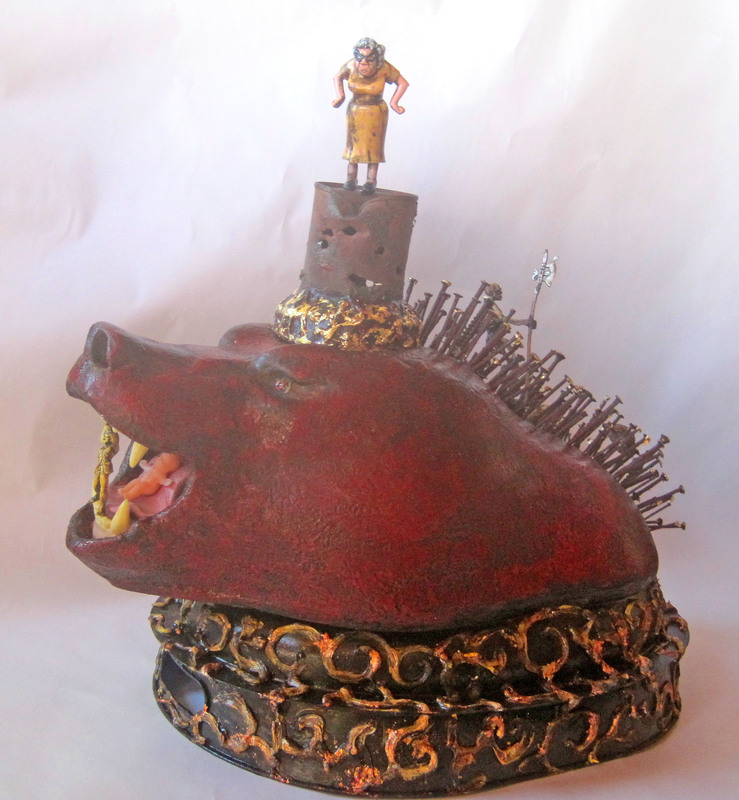 Reliquary for Feeling the Fear & Doing It Anyway! My last few months have been ones of inner turmoil: for 18 years I have been the director of an arts & crafts teaching venue that has fed me both financially & creatively in many ways. My job has evolved from mostly hands on teaching over the years to supervising 36 employees and doing routine aspects of my job & i have hit the “glass” ceiling- not a lot of room for growth. Time to go but scared to leave the “golden handcuffs” . In this economic climate was I crazy!? or were my anxiety levels so high because I had so compromised my true self & needed to move on? As always my art work reflects my personal life- I started working on an assemblage reliquary called “Listening to the Inner Voice of Wisdom” (more about that in the next blog) and after deciding to retire from my job as of June 1st, 2012, I quickly moved on to a reliquary for “Feeling the Fear & Doing It Anyway!”. What does fear look like? I decided to take a trip down the mountain to a taxidermy shop 2 hours away where I found a scary bear head with a full set of snarling teeth. As a side note, I had to buy the tongue separately- there were boxes of grizzly, black bear, badger, fox, wolf, coyote, deer, elk etc. tongues to choose from- who knew!? Next up- the inner critic: “what are you doing! ?”; “You’re crazy!”; “You are making a big mistake!”; “Are you sure you’ve thought this through? !” Isn’t she perfect!! What would represent the fresh start? the essential me? 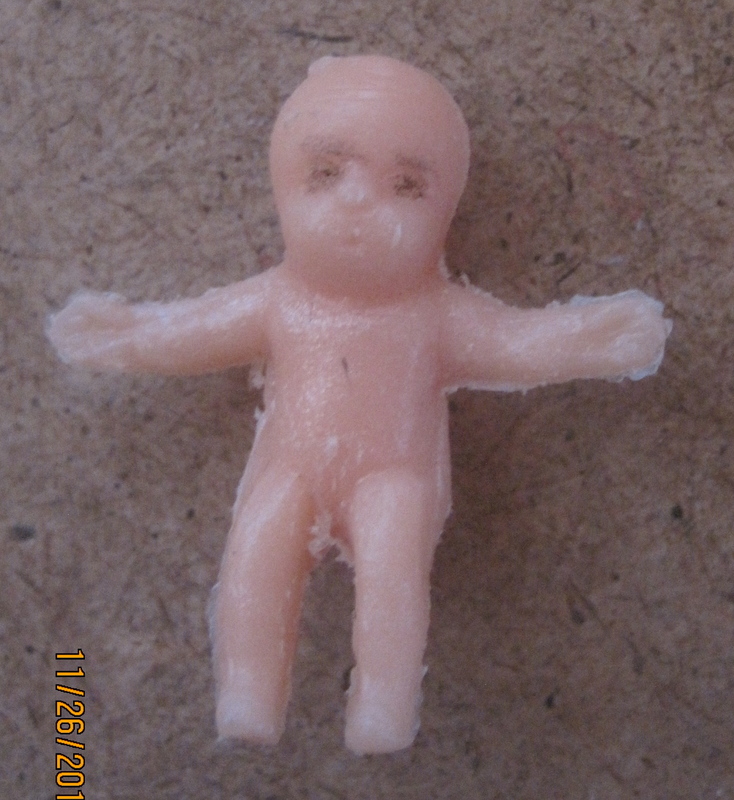 a plastic baby? I think she needs some gold leaf! How about the me now- the heroine- ready to open the jaws of fear & let the essential me out? Feeling the fear & doing it anyway! What am I most fearful of? …probably dying before I explore more possibilities of all that life on this beautiful earth has to offer, time passing so quickly. What about you? What are you fearful of? I am excited to be working on this piece- part of my process of creating art is working through my personal process of experiencing life. 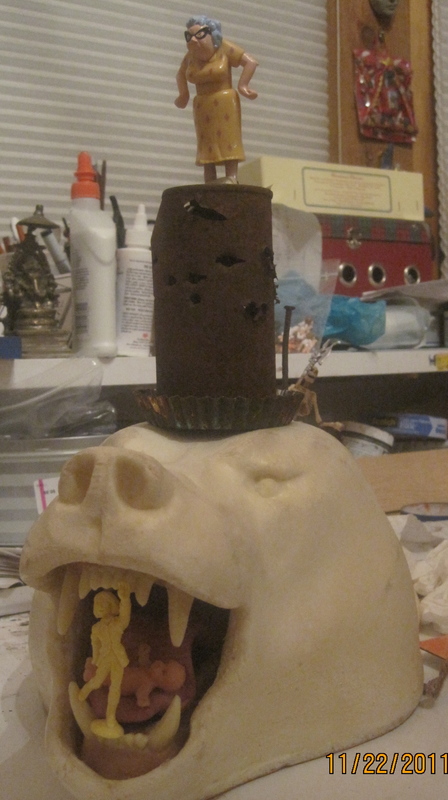 The shot up tin can, on top of the bear head, will be removed to reveal the relic- the sacred object that represents embracing change- what do you suppose that will be?